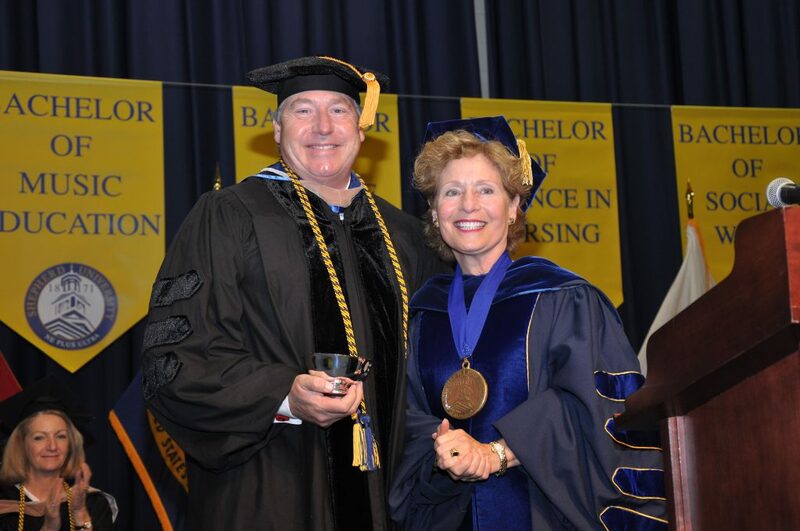 Michael A. Smith ’89, president of the Shepherd University Foundation, received the President’s Award in recognition of his extensive contributions to Shepherd University. Mike was presented with the award during Shepherd’s 144th Commencement Ceremony on Saturday, May 6, 2017. Mike is the vice president of Valley Proteins, Inc., a family-owned business in Winchester, Virginia, founded by his grandfather more than 60 years ago. The company’s focus is on creating renewable resources for animal feed and contributing to a cleaner environment by developing clean energy bio fuel. Mike earned a B.S. in business from Shepherd in 1989 and was a member of Tau Kappa Epsilon fraternity, serving as the group’s fundraising chair, a position that prepared him for his philanthropic interest in Shepherd University after he finished his degree. He is the fifth person to serve as president of the Foundation. During his involvement with the Foundation, Mike has endowed two funds in support of Shepherd University: the Gerald F. Smith Memorial Scholarship in honor of his father and the Edward L. Snyder Chair for Business honoring his grandfather. As a member of the University’s Business 20-20 Committee, Mike supported Shepherd’s efforts to create a School of Business by issuing a $250,000 challenge grant in July 2016 to support the revitalization of the business program, the first-ever challenge at this financial level for Shepherd. The challenge was met by supportive donors, and more than $650,000 were subsequently raised for the business school. Mike is the past president of the Winchester Youth Development Center and Eastern Region Renderers Association, and sits on the boards of several organizations. An avid horseman, he is a two-time national champion and was at one time in consideration to be an Olympic equestrian until a riding injury prevented him from attaining this goal. With his Olympic dreams dashed, Mike enrolled as a student at Shepherd University due to its close proximity to his home and horses. In retrospect, he says it was a serendipitous decision that resulted in a fantastic experience.